After graduating from Canadian Memorial Chiropractic College, Dr. Mark Del Cantero began practicing in 1996, first for a year in British Columbia before moving back to Ontario to start practicing here in Ancaster. Over 21 years in Ancaster, we have been blessed with tremendous growth and have moved the clinic to accommodate growth and to provide a healing environment equipped with cutting-edge technology and efficiency for our patients. When Dr. Mark and his wife lived in British Columbia for a year, they spent a lot of time hiking through the forests. 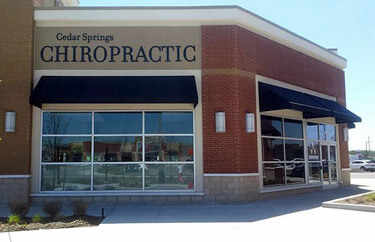 He chose Cedar Springs Chiropractic because he wanted a unique name that creates a feeling of peacefulness. To set people free to live an abundant life. We do that by helping to restore physical health, hope and relationships. We are a corrective care clinic that features in-house digital X-rays so we can determine if a patient has structural and/or degenerative problems in their spine and provide correction through adjustments, tractioning and muscle rehab. People of all ages, from children to seniors and everyone in between can benefit from natural and effective chiropractic care. As a family wellness clinic, we want to help individuals throughout their life keep their nervous system functioning at its peak. We especially enjoy treating people who are already living a healthy lifestyle such as eating well and exercising regularly. In addition to providing natural health care, we also like to help patients with goal setting and achieving the dreams they have for their lives and their relationships. If you’ve been to other practitioners’ offices and haven’t gotten the results you desired, we are different in that we can specifically tailor chiropractic care and rehab to get the outcomes you’ve been hoping for. We’ve also had success with more serious and challenging cases. Contact us today to take advantage of our new patient special: a free consultation and exam ($80 value)!